During the Great Depression, just as Hitler was rising to power in Germany, an improbable group of young men at the University of Washington came together to form a rowing team. Their coach knew this combination of young men had something special when they came together, and though at times they could be frustratingly disjointed, when they were successful they were amazing. Daniel James Brown recounts in great detail the formation of this team and their ultimate quest for gold at the 1936 Olympics in Berlin. The source material included diaries, journals, letters and scrapbooks from family and friends of members of the team. I frequently wonder how nonfiction writers recreate such exacting details about their stories, but Brown has copious notes about his sources in the back of the book, divided up by chapters. I wish I had realized these notes were there before I finished because I think I would have liked to know where he got specific bits of information as I was reading. At any rate, he's obviously quite meticulous and conscientious about the truth and accuracy of his story. For me, the most enjoyable parts were those that focused on people, especially the rower Joe Rantz. Much of the story centered on him as he and his daughter supplied so much of the story to the author. Rantz came from a pretty troubled background, completely abandoned by his family at a young age, and managed to retain a strong sense of drive and ambition. After his mother died and his father took off with his new wife and their kids, Joe was left alone to fend for himself. He repeatedly tried to get back in the family's good graces over the years, only to be rejected over and over again by his stepmother. But he just kept on working towards his goals, taking whatever jobs he could get to survive and pay his way through school, not dwelling on the negative at all. Joe's story was quite inspiring and I couldn't help but like him. His story was the best part about this book for me. 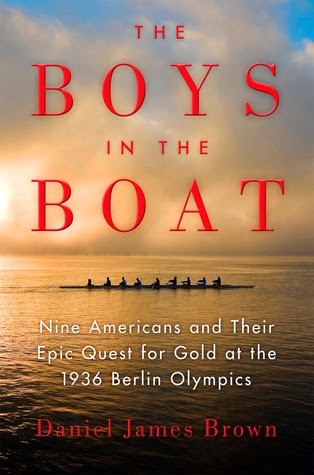 The rise of Nazi Germany and its preparation for the Olympic games was an ominous backdrop, especially when coupled with the story about one of the rowers, Bobby Moch, learning that his family is Jewish. (Fun fact: one member of a competing Olympic team was Ran Laurie, the father of actor Hugh Laurie.) Details about life in during the Depression also added a great deal of interest. A speech in which FDR roused a crowd to pull together for the good of the nation only echoed the feelings of team spirit imparted to the rowers by their coach. There were other more universal themes as well. I've talked to friends about this feeling many of us get about not being as competent as everyone around us thinks we are. You know, that feeling like one day your workplace will suddenly figure out that you're a complete fraud and have no idea what you're doing. Joe Rantz felt this way with his rowing - he was convinced that he was weak link and just lucky to be there. But like all of us with our jobs, Joe wasn't alone. Every single member of the team felt the same way, and thought he was the only one who did. I was sort of struck by that story, and the implications of how these feelings of inadequacy can affect the dynamics of a team. I'm not interested in rowing, or any sports for that matter, so I'm definitely not the audience for this book and wouldn't ever have picked it up on my own. It's a nominee for next year's community read (along with several others I've been reading) and I just barely managed to get through it. Subjectively, though, it's a good book - well-written, detailed, and undoubtedly inspiring to many. I can understand why it has been so popular, but ultimately it's a book about rowing and if you're not into rowing it's a tough slog. It took me nearly two weeks to read, and though I have a certain appreciation for it and enjoyed parts of the story, I'm also relieved to be done.